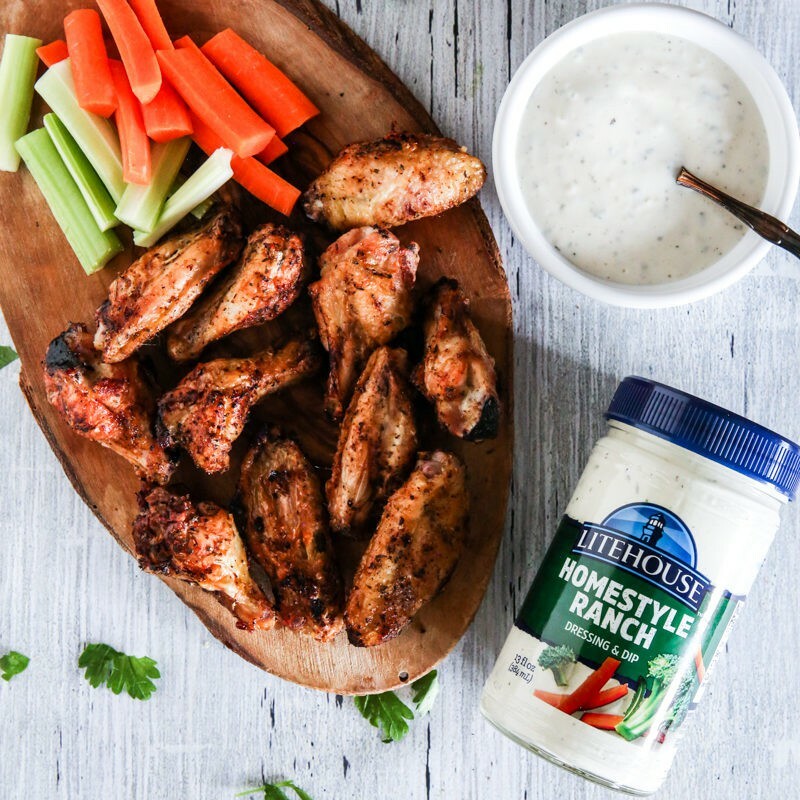 Thanks to Farm Rich and Litehouse, two of our favorite brands to serve while homegating with our friends and family, for sponsoring this post! Be sure to scroll down for more information about the incredible giveaway from Farm Rich, too! Game days are my favorite days. I get to make all the yummy snacking foods I love and cheer on our favorite teams! We love to invite friends over on big game days too. It’s so much fun! Gathering around the TV in the comfort of our own home is definitely our favorite way to watch the Big Game. 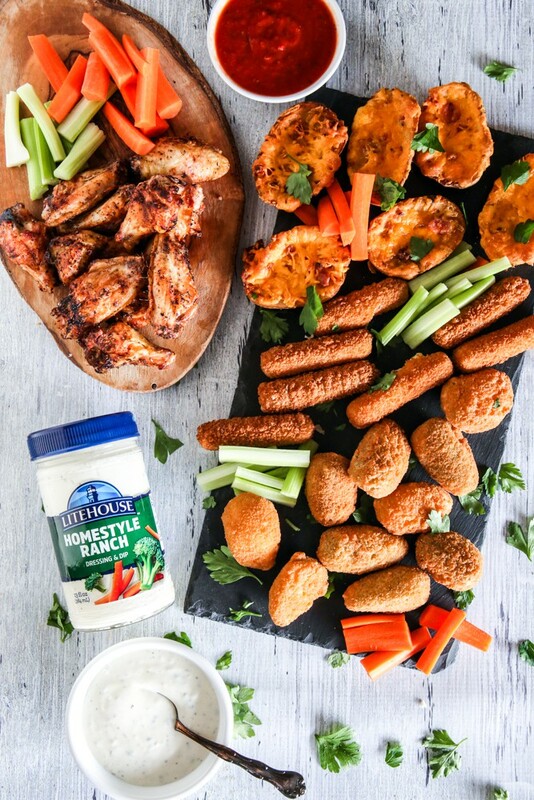 Homegating is the new tailgating for us, and with products from Farm Rich, it makes our game day spread that much easier and tastier! In addition to serving our favorite game day bites, we always grill my husband’s famous wings. Grilling wings while watching the Big Game is one of our favorite traditions. We have a large sitting area and big screen TV on our back porch, right beside our outdoor kitchen. It’s such a great spot to gather with friends! All of our friends and family love to hang out in this area while enjoying the smells of the grill and watching the Big Game! When we’re homegating, I like to keep things as simple as possible too. So, while my husband is taking his time grilling the wings outside, I’ll prepare the rest of the spread inside. I like to serve treats I know everyone will love like Farm Rich Mozzarella Sticks, Jalapeño Peppers and Loaded Potato Skins. These are always big hits at our get-togethers. When I have guests over, spending my time with them is my number one priority. That’s why I choose game day snack options that are not only easy to prepare but can also be made easily in just minutes. 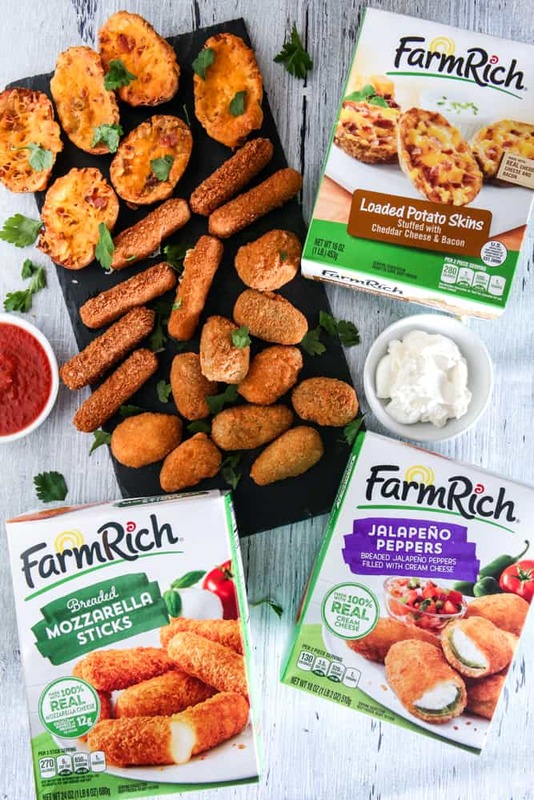 Farm Rich is my favorite brand for all those delicious game day snack items. They have an assortment of different Meatballs, NEW Grilled Cheese Sticks, Mozzarella Sticks, Loaded Potato Skins, Jalapeño Peppers and Mozzarella Bites available at grocery stores nationwide in the freezer section. I purchased my appetizers shown at Walmart. They are all easy to prepare and guests will be sure to love them! 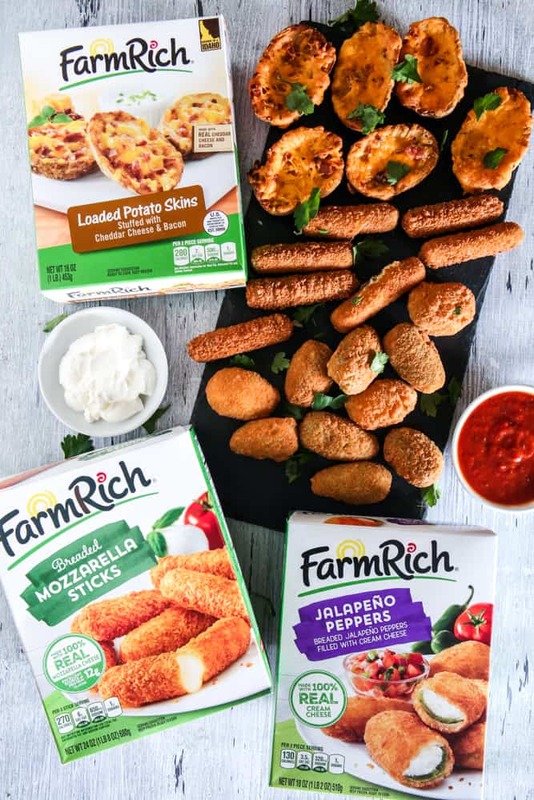 Farm Rich offers a complete line of easy to prepare frozen snacks and appetizers that are made with quality ingredients friends and family love. These tasty options can be served on Game Day, or any day as a quick family meal or fast snack for the family. I like to prepare the deep-fried Farm Rich products in the deep fryer (per package directions), but you can also bake them or prepare some of them in the microwave in just minutes! 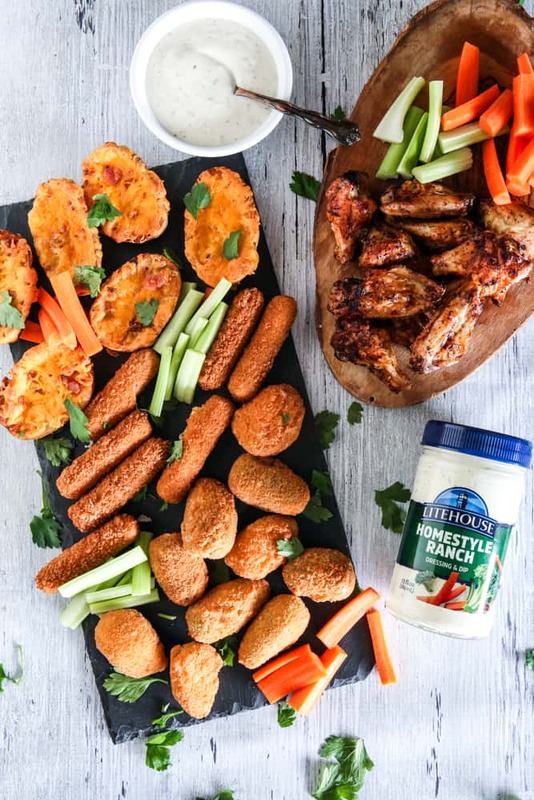 And to serve with all these delicious treats, Litehouse Dressings& Dipsare perfect. 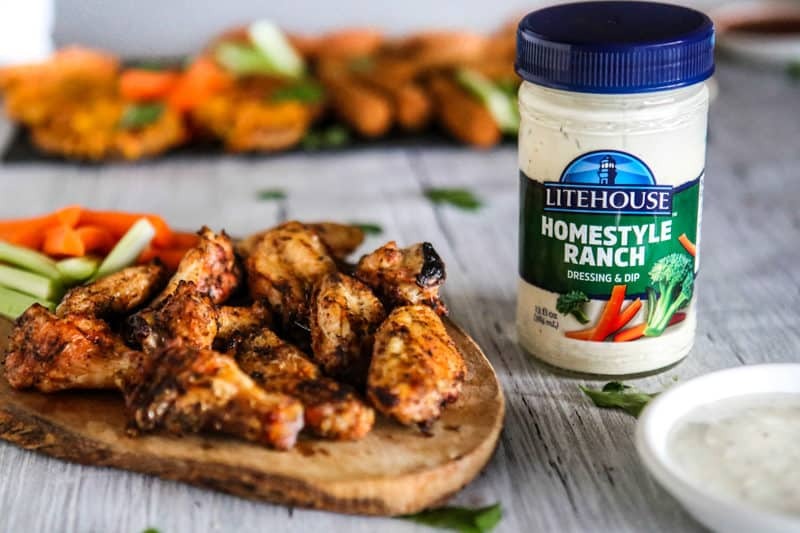 Here I have the Litehouse Homestyle Ranch, but I also serve the Litehouse Chunky Blue Cheese with wings. 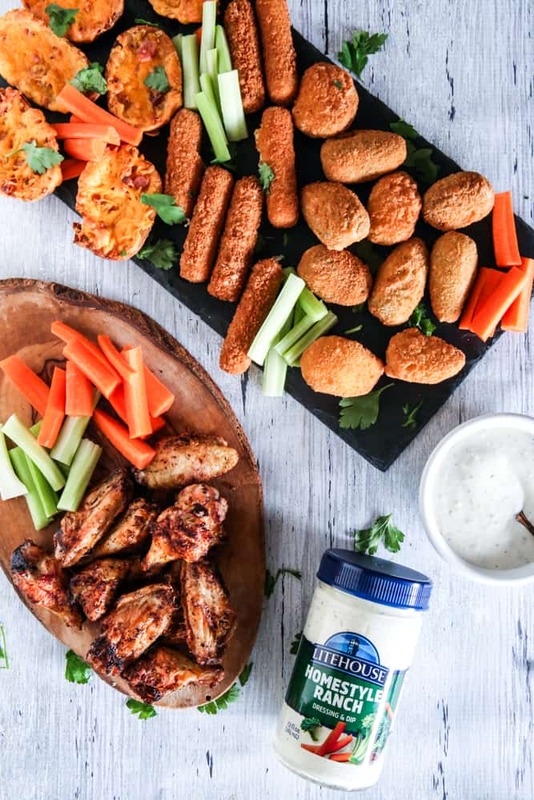 These dressings are the perfect complement to wings, fresh veggies, Mozzarella sticks, Potato Skins, pizza and other popular game-day fare that guests adore. Be sure to look for Litehouse Dressings & Dipsin the refrigerated produce section of your local supermarket. 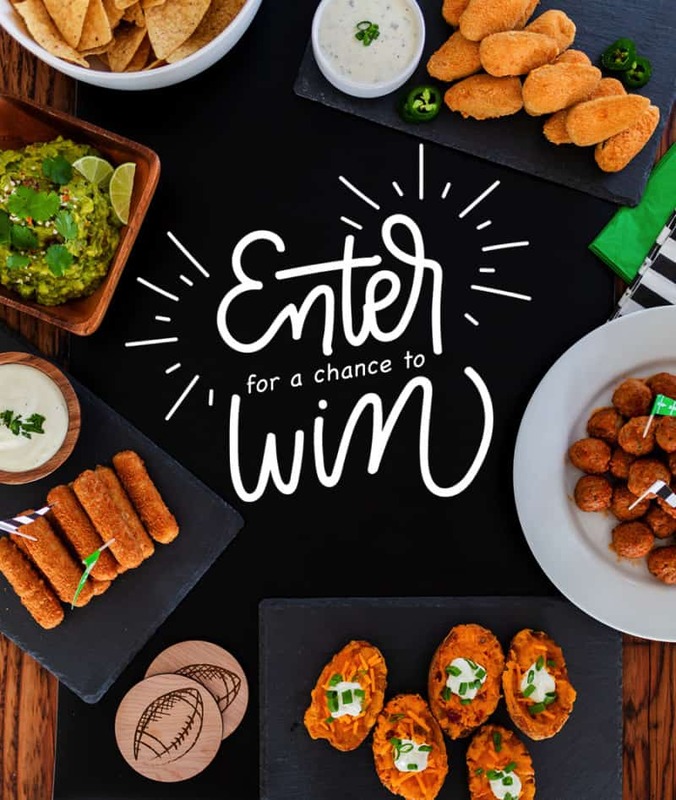 Be sure to also visit the Farm Rich Instagram page to enter the Farm Rich and Litehouse Giveawayfor amazing prizes including a great Game Day party in a box (+ TV)! See Terms and Conditions here. For more Game Day ideas, visit Farm Rich’s website here. This is a sponsored post written by me on behalf of Farm Rich and Litehouse. Great EASY apps for game day get togethers! The invitation to enter the giveaway ended two days ago on January 27th yet I received this email on the 29th of January. Where are your recipes? I’m new to your website and there are no game-day recipes anywhere to be seen.